New Delhi: The Hero MotoCorp pavilion at the Delhi Auto Expo, the Indian auto industry’s schmoozefest, has a busy crowd—most of them attracted by the XPulse 200 adventure bike. The ushers in their bright red dresses beside the scooters and bikes are a striking contrast against the white facade, decorated with hundreds of green saplings. Everything looks perfect, except that Hero, the world’s largest bike maker by volume, doesn’t have an electric vehicle—not even a concept—on display. This, at a time when electric vehicles (EVs) are becoming cheaper, faster than ever before, and are a practical alternative to petrol-fired vehicles. The pivot towards EVs is expected to be sharper in the months and years ahead as prices of lithium-ion (Li-ion) batteries plummet, while its efficiency and longevity increases. At the heart of this upcoming change is India’s two-wheeler industry—the largest in the world selling 18 million vehicles every year—which few are talking about. Much of the limelight in electric mobility is hogged by a few car and bus makers. “It’s not only in EVs, the media tends to write more about four-wheelers. That’s the general trend, (even though) the larger part of mobility in India is two-wheelers," says Pawan Munjal, chairman and managing director of Hero MotoCorp. For Munjal, who wants to build Hero MotoCorp into a transportation technology company rather than just being a commuter bike maker, EV is the segment to bet on—Hero’s investment of over Rs200 crore in Ather, an electric two-wheeler start-up from Bengaluru, is a step in that direction. “We have close to 30% stake in that company, we are putting our money where the mouth is. We believe in the future of EVs around the globe and in India," says Munjal. Inside its own stable, too, Hero MotoCorp is working on a few models. “We are experimenting. It is just not enough to have the electric vehicles in the showrooms. It should fulfil customer needs otherwise people won’t buy them," says Markus Braunsperger, chief technology officer. On his EV to-do list are: fully electric bikes, hybrid two-wheelers, boosting power through capacitors, and new technologies like recharging the battery while riding or braking the vehicle. “It is not about a single solution… you need a bunch of solutions," says Braunsperger, a BMW veteran of more than two decades. For Hero, in the EV segment the focus will largely be on the commuter segment. “This gives us additional opportunities, but it has to make business sense," Braunsperger says, without fussing much on the lack of infrastructure. Market watchers believe that two-wheelers will help grow the EV segment—after all, sales of two-wheelers in India outpace those of cars 5:1 (cars sell about three million a year). “We will see electric two-wheelers as a way to adapt proclivity of electric mobility in India, instead of forced adoption through four-wheelers," says Rebecca Lindland, senior director and executive analyst at California-based vehicle valuation and auto research firm, Kelley Blue Book. Others agree. “It will take some time but two-wheelers will take off much faster than cars," says Abdul Majeed, partner at consulting firm PwC India. “In the next two to three years, a lot of electric scooters will be sold." NITI Aayog in a May 2017 report, mentioned that two-wheelers—both private and fleet—will have a quicker adoption of electric mobility. Consulting firm KPMG suggests that electric two-wheelers’ adoption will precede that of buses and cars. According to industry group Automotive Component Manufacturers Association of India (Acma) and consultant Roland Berger, 44,000 electric two-wheelers were sold in 2016-17, more than double the previous year, in India. A lot of the credit goes to Li-ion batteries. Hero Electric, started by Pawan Munjal’s cousin Vijay Munjal and not a subsidiary of Hero MotoCorp, rolled out its first electric bicycle in 2001. It bombed. “The mopeds were going out of the market. We hoped to bridge the gap between cycles and scooters," says Vijay’s son and Hero Electric managing director Naveen Munjal. The prices were very high and they were powered by lead acid batteries, which were not only expensive but also had a lower power output and shorter life span. Result? A stunted adoption. Seven years later, there was a false start. In 2008-09, Naveen remembers, India sold 80,000 electric two-wheelers—most of them bikes with top speeds of 25kmph but high in demand because of the low running cost and because they didn’t need a driving licence. Buyers thought these bikes would be maintenance-free but they broke down often. Beginning 2010, sales in the auto industry in India started slowing. Almost overnight, players who had entered the EV market for a quick buck pulled out. Thankfully, Hero Electric had set up service stations. “The vehicles were of low maintenance, but not ‘no maintenance’ as people thought… we started supplying parts to our competitors’ products to keep the market alive," says Naveen. The government had to act. In 2013, the UPA-II government came up with the National Electricity Mobility Mission Plan where Rs13,500 crore would be given as subsidy on EV purchases and for building infrastructure. In 2015, the Narendra Modi government put its heft behind EVs and released the so-called FAME Scheme (Faster Adoption and Manufacturing of (Hybrid &) Electric Vehicles in India) aimed to provide subsidy for EVs to boost its adoption in the country. By now, globally, lead-acid batteries were being replaced by Li-ion batteries. It was the beginning of a new era that would completely change electric mobility. Naveen agrees that the market is changing. “The companies coming into this space are much more serious… most of them are making vehicles, which run on lithium-ion batteries," he added. Hero Electric will launch two Li-ion battery scooters, will have Li-ion variants in its already existing five models, and is planning to launch eight Li-ion-battery-operated bicycles. In a country where infrastructure is lacking, lead-acid batteries were heavy and could not be taken out to charge. A one kilowatt per hour battery would weigh more than 25kg. A comparable Li-ion battery is about two-thirds lighter: 7-9kg. The life of the lead-acid battery in automotive use is one to two years, while a Li-ion battery lasts four to five years. Parveen Kharb (left) and Vijay Chandrawat, founders of Twenty-Two Motors. “Electric two-wheelers are much more viable as far as charging in houses are concerned compared to cars as the batteries are lighter and can be carried into the house," says Deepesh Rathore, a London-based analyst and director of Emerging Markets Automotive Advisors, an auto consulting firm. Most of the large two-wheeler makers are also drawing up their Li-ion-battery vehicles. Hero MotoCorp’s Munjal says that at a recent board meeting, the main question from the directors was “what is going on in EVs". Munjal had his answer. Two years ago at the Auto Expo, Hero MotoCorp had showcased the Duet E. “It was more to say that we are starting work in our R&D on EV products. This time we have not shown because we are not fully ready," says Munjal. Rival Bajaj Auto has plans to launch a new brand, Urbanite, for EVs by 2020. TVS Motor Co. Ltd is developing an e-scooter (codename U218) to be launched in 2018. Honda Motorcycle and Scooters India Pvt. Ltd is in discussions with stakeholders to bring down cost and ensure infrastructure availability to launch products in India. TVS and Honda declined to comment for this story. However, a TVS executive gave some details. The company showcased the Creon concept motorcycle at the Auto Expo. “It is an eight kilowatt hour (kWh) lithium-ion battery-powered vehicle, which can reach to speeds up to 115kmph," says the senior executive, on condition of anonymity. TVS has no plans to introduce lead batteries. If the lead battery gets completely drained, its life comes a fourth of the actual life. “In India, people have the tendency to nearly drain the battery before putting it on charge," the TVS executive says. “In case of lithium, even if you don’t take care of the battery, it will last for five years." Still, Li-ion batteries cost 2.5 times the cost of lead acid batteries, even after the rapid drop in price of Li-ion battery packs. Munjal is contemplating if Hero MotoCorp should invest in battery pack manufacturing. “From Hero’s point of view, 40% (government’s target of electric vehicles share) by 2030 will be five million units a year for us… We are not at a stage where we can say that we have fixed our battery suppliers—whether we will get it from outside, or we will make it ourselves, which can be done with our kind of volumes," he says. Some of the established automakers are differentiating in building the product. For example, Mahindra and Mahindra is not making a bike, but is developing a three-wheeler that will seat two people. “You will see new ways of mobility. In UDO, there are two front wheels and one rear wheel," says Mahesh Babu, CEO of Mahindra Electric. UDO is short for unique driving object, which the company unveiled at the Auto Expo. But it’s not just the Heros and the Bajajs who are at the centre of action. Several start-ups are elbowing their way into electric mobility. Two-wheelers are easier to make compared to cars, after all, and Li-ion vehicles have a lot to leverage from the new technology and design. Let’s look at the demand. The Acma-Roland Berger report mentions that by 2025—seven years from now—34.5% of the total two-wheelers can potentially be electric. That number is about 11.6 million vehicles. But, does India have the capacity? “Production capacity would be the major limiting factor for EV penetration in two-wheeler segment," the report says. The opportunity is big, in other words. Ather, Okinawa Scooters, Twenty-Two Motors and a bunch of other newbies have opened shop in the past three to four years to tap into this opportunity. For Jeetender Sharma, founder and managing director of electric bike maker Okinawa Scooters, the future is in electric mobility. He believes that he can build a business that his son, now six and half years old, will be able to run in the coming years. Sharma launched two electric scooters during the Auto Expo. The cost of running bikes is why he believes people will change to electric. His bikes, both running on lead batteries, cost 10 paisa per km. A petrol bike costs Rs1.70. His battery vehicles run over 80km with a single charge. Each bike has two batteries giving a range of over 160km. In the coming months, Sharma will launch an existing bike with Li-ion batteries. Ridge, the bike that is currently priced at Rs42,000, will cost Rs55,000 with Li-ion batteries (as much as the popular Honda Activa scooter) and will run up to 120km per battery on a single charge. “We will have both lead and lithium variants… India is a price sensitive market," says Sharma, who says he is not fazed by Hero MotoCorp or its like. Others believe that everyone is starting on a fresh slate. Gurgaon-based Twenty-Two Motors has launched two Li-ion-battery-powered smart and connected scooters, bookings of which can be done online. “We have tried to apply intelligence to the vehicles and gather data using sensors," says its chief executive officer (CEO) and co-founder Parveen Kharb. Each vehicle has more than 60 sensors, which sends data back to the servers. Algorithms in the back end run a simulated model of the scooter. “The simulated models run 50-100km ahead of the real vehicle, and help predict the condition of the battery and the overall scooter based on riding behaviour, acceleration, road conditions, among other data," Kharb explains. The scooters come equipped with cruise control, reverse gear, and a so-called ‘drag mode’ in which the scooter can be rolled alongside the rider slowly without pushing like with a flat tyre. Emflux Motors unveiled the Emflux ONE, a super bike that can touch 100kmph in three seconds, at the Auto Expo. The product is being tested before certification and an ambitious April launch date. “The design and circuits are developed in-house and the bike is 70% to 80% production-ready," says Ankit Khatry, co-founder of Emflux Motors. Emflux and Twenty-Two Motors will open experience centres in major cities for people to look up and test the bike before placing orders online. Another company that has been at it is Ather, perhaps the biggest of all the electric two-wheeler start-ups and is funded by Hero MotoCorp. Ather began its journey in 2013 at the IIT-Madras Research Park. IIT-M alumnus Tarun Mehta and Swapnil Jain had set out to build India’s first smart electric scooter. But they faced a unique problem. Unlike an ICE (internal combustion engine) scooter company that could go to its manufacturers and give them the specs and specific design requirements even when the core subsystems remained unchanged, Mehta and Jain had to build everything from scratch. Finally, they came up with the S340, which has a range of about 60-65km on a full charge and is fitted with a touchscreen console with inbuilt apps like maps. The scooter is also connected to Ather’s system and supports features like breakdown alerts and over-the-air firmware updates for the two-wheeler like is done by the storied Tesla Motors. Mehta says two-wheelers will lead the EV adoption because of the economics. “A consumer is more probable to pay a Rs30,000 increment to buy an electric two-wheeler than the few lakhs (extra) for an electric four-wheeler," he says. There are other advantages, too. “On the production side, it is also a shorter development cycle for an electric two-wheeler as compared to an electric four-wheeler," adds Mehta. ■ Announced and existing EV models in India can compete with vehicles in less than 125cc segment only. ■ Customer affinity towards 125-250cc segment is increasing in motorcycles, therefore it is expected that by 2025 only 49% of motorcycle segment would be less than 125cc. 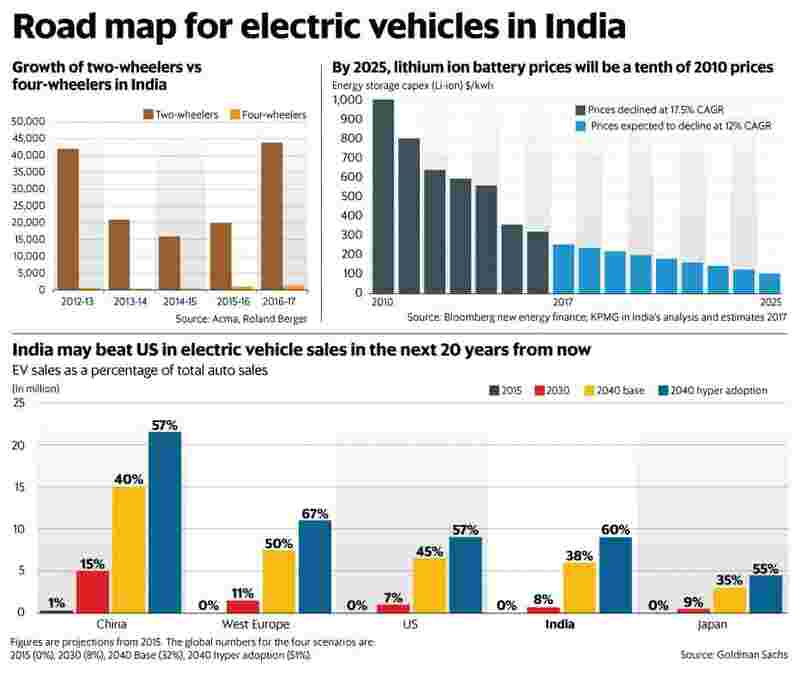 ■ Rural market, which accounts for 50% two-wheeler sales in India, would not be impacted by EVs. Then, there are people problems. “When we started, our first challenge was to find good and experienced people… Then there weren’t many good suppliers. The ones that were, were already loaded up with huge orders and our orders were just for prototyping of two to three units. No one was actually ready to entertain these small quantities," says Khatry of Emflux. Added to that, the government is yet to come out with the EV policy and give guidelines to build charging infrastructure—both of which is critical for widespread of EVs. Munjal ends on a pragmatic note. Companies like Hero, which already have large volumes in the IC engine, cannot shift to electric mobility overnight, he says. “It will be a slow and steady ramp-up. IC engines are slowly ramping down and EVs are ramping up. Enough time needs to be given for the infrastructure to be set up. Enough time should be given for the manufacturing to be set up. If there is a quick switchover, it is going to lead in drop of sales volumes to a large extent, which in turn could hurt the industry." Anand Murali contributed to this story.